The TLEs are updated everyday by NORAD here. The APRS-DP transceiver of BIRDS-2 CubeSats operates at 145.825 MHz. The aliases for the satellites are APRSAT, ARISS or the respective satellite ID (BIRDPH for Maya-1, BIRDMY for UiTMSat-1 and BIRDBT for BHUTAN-1). The Digipeater transmits a beacon signal every 45 sec once activated. Follow the link here for latest TLE from NORAD. BIRDS-2 team will use CWget Software to decode the Morse Coded CW Beacon signals from the CubeSats upon release from ISS. But, in case if the signals are weak or if the signals are overlapping from the each CubeSats, the strategy adopted by the team is to record the audio signal of the beacon (we use AudaCity), and try decoding it using CW Skimmer software. If successfully decoded, the software should display the decoded Morse character in the format described in the section below. And the 20 Hex characters of the House Keeping data can use further decoded using our decoder software BIRDS-2 CW Morse Code Beacon Analyis Software. All three CubeSats of BIRDS-2 project will be operating with same Uplink and Downlink frequency. Each CubeSat will transmit CW Morse coded beacon signal at 437.375 MHz. Telemetry and Mission Downlink will also be carried out using the same frequency but only upon successful Uplink Command. But since the CubeSats will be released at the same time from ISS, there is a possibilities that the beacon signals from three CubeSats will interfere with each other making it difficult to decode at ground. To avoid that, one of the measures adopted by the team is as described below. The CubeSats will be released together, which means they will Turn ON almost at the same time. Once Turned ON, one of the first thing it does is to start transmission of beacon signal to indicate it is alive. But the CubeSats are programmed in such a way that each of them will wait for different amount of time before it starts the transmission of beacon signal. The first satellite coming out of the J-SSOD will be the first to start transmission of beacon and it will remain silent for long enough to let other two satellites finish their beacon transmission. The initial sequence is as illustrated in the picture below. 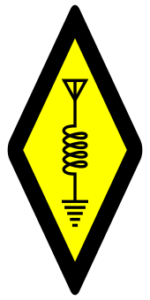 The initial beacon signal period is set as 115 sec (30 sec transmission and 85 sec silent time). This is a temporary solution for the initial operation phase. 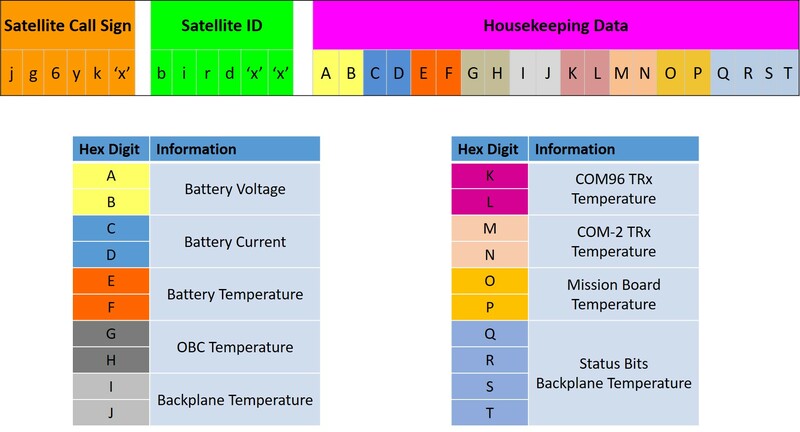 The CW Beacon signal transmitted from the CubeSats has format as shown in the picture below, which also shows the definition of each hex digit of the house keeping data in the beacon signal. The call sign and satellite ID of respective CubeSat will precede the housekeeping data. Three 1U CubeSats developed by 11 students from Japan, Bhutan, Philippines and Malaysia at the Kyushu Institute of Technology (KyuTech) through BIRDS-2 project under the BIRDS program has been successfully launched on a SpaceX Falcon 9 along with resupply cargo to ISS (CRS-15) in a Dragon Capsule. The Dragon has been successfully captured and the CubeSats will now await release from ISS which is expected sometime in early August. The CubeSats will operate in Amateur bands and the team would appreciate support from amateur community throughout the world to help us with initial acquisition of beacon signal. All three CubeSats will transmit Morse Coded CW beacon at 437.375 MHz.